Tools needed: Greenstuff, Plastic base, knife, paperclip, toothpick or modeling tools, glue such as epoxy, and wax paper. Note that I at first tried this will milliput, but that was a disaster -- the twisting aspect of step one was impossible as it would break instead of twist. 1. 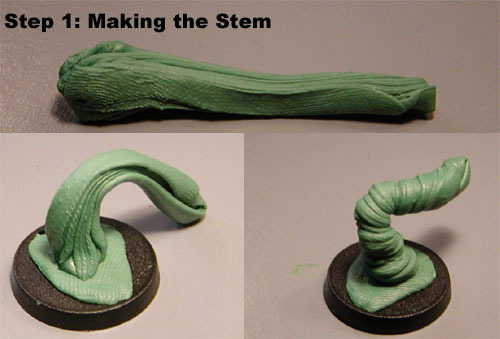 Take the mixed greenstuff and stretch it out like taffy, and then fold it over itself. What this does is form a group of ridges which will help give the stem an organic feeling. Make it a little smaller than the thickness of a pencil. 2. Take a base and put a thin layer of putty on it. If there is a slot, fill it in; it's not needed. Attach one end of the stem made in part one. 3. Now the fun part; twist the stem so it gives a chaotic twisted surface. I like it if it's not quite straight as it gives the final mushroom a more "dynamic" look. You may want this part to harden if you are worried that handling it will destroy it. If you don't like the look of it, try again! This is the easiest step and experimenting with it can help. 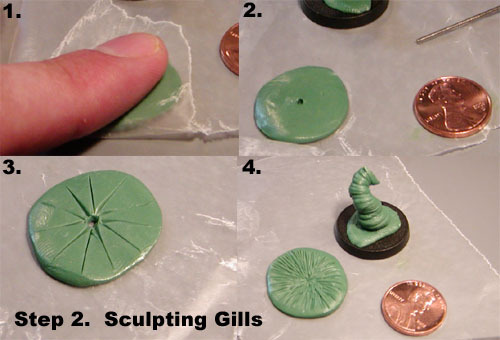 Next, we sculpt the gills for the mushroom. 1. Using wax paper, flatten out a coin-sized object. 2. Poke a hole in the middle, and let this coin harden for a while; perhaps an hour. 3. Take your knife and cut slits. Go outward from the center radially. I think it's easiest to work on the whole thing at once, and not concentrate on one section. Don't let the slits cross! Don't make them too thin -- we will eventually want to do an ink or paint wash and have that get into the cracks. 4. Continue cutting slits until the entire coin-sized disc is covered. You may want this part to harden if you're worried that handling it will damage it. 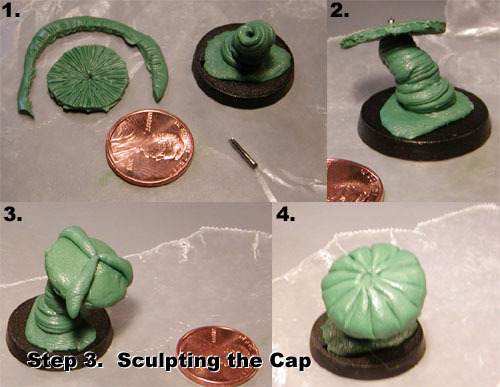 Next, we sculpt the rest of the cap. 1. Trim the gills to the size you want, and trim the stem to the length you want. It's a good idea to trim the stem by cutting into a valley as it disguises the cut. Poke or drill a small hole into the tip of the stem so a paper clip pin will fit. 2. Glue (I used epoxy glue) the disk (gills side down!) and stem together, with the pin as a strengthening device. Let the glue dry. 3. Reinforce the top of the cap, making the middle part thicker and cover up the pin. Imagine that the cap is a clock. Attach three cone shaped amounts of greenstuff at the 12, 4, and 8 position. This splits it up into three identically sized segments. Smooth out the thicker part of the cone along the edge of the gills. 4. Bisect each section with another cone shaped amount of greenstuff at the 2, 6 and 10 positions. Then fill in the gaps between with another cone. This should give 12 identically looking sections to the cap. You may want to do a little bit of clean-up sculpting with a tool (like a toothpick or a knife) to make sure that all the cone sections interect and smoothly approach the center of the cap. Poke a small indentation into the top of the cap. You may want this to harden slightly. Now, just a few final touches and we're done! 1. Roll a small ball and attach it to the top of the cap to hide some of the joins at the tip. This should cover the small indention made in the last step. Roll out a small snake and attach it to the edge of the cap to form a rim. 2. Cut off the excess rim and smooth it out, joining the front and back of the snake together. Take your knife and cut a shallow cut into the rim so the cuts are in the same positions as the top of the cap. 3. Make some more shallow cuts into the rim; I did two more per section. Now you're done! Let it harden for a day or two, prime it, and paint it like any other miniature. Here is how I painted some earlier versions.